The SNP has surged to historic victory over Labour and become the Scottish Parliament's largest party on a gloomy final election day for Tony Blair. The Scottish election, marred by huge problems with voting systems, showed "that the wind of change is blowing", according to SNP leader Alex Salmond. In Wales Labour lost three seats but remains the largest party. In England the Conservatives made big gains. Mr Blair said the results were better than "the rout" that had been expected. BBC projections based on the English council results put the Conservative share of the vote at 40%, the same as last year, with Labour on 27%, one point up, and the Lib Dems down one point at 26%. Lib Dem leader Sir Menzies Campbell said he had always known the elections would be "tough" and called the results a "mixed bag" for his party. The Tories, who have gained more than 870 extra councillors in England, say they are now on course to win the next general election. But Mr Blair, who is due to announce a date for standing down next week, told the BBC: "People thought it was going to be a rout and it's not turned out like that. "You always take a hit mid-term, but these results provide a perfectly good springboard to win in the general election." His likely successor as Labour leader and PM, Gordon Brown, issued a statement promising to "listen and...learn". In Scotland the counting process was complicated by an unprecedented number of spoilt ballot papers - predicted to be as many as 100,000 - with voters and counting machines struggling to come to terms with complex ballot papers. The Electoral Commission has launched "a full independent review of the elections" into the chaos. In the Scottish Parliament, the SNP won 47 of the 129 seats, compared with Labour's 46. The Tories won 17, the Lib Dems 16, the Greens two, with independent Margo MacDonald also re-elected. 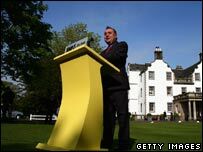 SNP leader Alex Salmond said Labour had lost its "moral authority" to govern and promised a "full judicial inquiry" into the vote-counting "debacle" if he becomes first minister. He added: "Scotland has changed for good and forever. There may be Labour governments and first ministers in decades still to come, never again will the Labour Party think it has a divine right to government." Mr Salmond will now seek to form a ruling coalition. The maths mean three parties will be needed to form a majority. Labour's Jack McConnell, who was hoping to remain as first minister, had earlier told his supporters it had been the "toughest and most hotly contested election in Scottish history". And Lib Dem leader Sir Menzies Campbell, asked on Thursday morning if he would consider forming a coalition with the SNP if they insisted on holding a referendum on independence, said: "Absolutely not ... We are against independence, that's our position and it ain't going to change." In Wales, Labour remains the largest party in the assembly but it has fallen short of the 30 seats needed for a majority, with both the Tories and Plaid making gains. Labour has 26 seats, down three, Plaid has 15, up three, while the Tories remain with 12, the Lib Dems six and other parties one. First Minister Rhodri Morgan said: "I feel very upbeat about the situation of Welsh Labour and our relationship with the people." But Plaid leader Ieuan Wyn Jones said the electorate had "voted for change". In England, the Tories increased their tally of local authorities - including Plymouth, Chester and Blackpool - and claimed the scene had been set for general election victory. Tory leader David Cameron said his party, which has gained at least 870 more councillors, had secured a "stunning" set of results, especially in the north of England. "We're the one national party speaking up for all of Britain... I think we can really build from this point, really go forward... the Conservative Party is really where it should be at the moment and I'm very pleased about that," he said. Home Secretary John Reid said of the Tories: "They are in a much stronger position under David Cameron than they were under Michael Howard, Iain Duncan Smith or William Hague. "But that doesn't make them league leaders." BBC political editor Nick Robinson, assessing the picture across Britain, said: "By any conventional measure, if we look at Labour and don't think about their opponents, this is pretty dire." He added that politics was a "comparative business", with Labour supporters maintaining the hope that the Tories "aren't far enough ahead to guarantee their victory" at a general election.